RETRO KIMMER'S BLOG: TRANS-SIBERIAN ORCHESTRA: NEW RELEASE AND WINTER TOUR! TRANS-SIBERIAN ORCHESTRA: NEW RELEASE AND WINTER TOUR! Since its formation, TSO has been a touring juggernaut, leaving crowds of all ages speechless after being introduced to the wonder of the group’s music and on-stage spectacle year after year. To date, TSO has played an excess of 1,600 shows for more than 12 million fans, cementing itself as one of the world’s biggest rock arena acts. TSO will hit the road again next month for its Winter Tour, based on the group’s cherished Yuletide story “The Ghosts of Christmas Eve,” featuring such lasting crowd-pleasers as "Christmas Eve Sarajevo 12/24," "O’ Come All Ye Faithful," "Good King Joy," "Christmas Canon," "Music Box Blues," "Promises To Keep," and "This Christmas Day." Starting on Nov. 18, TSO began the 2015 Winter Tour to 60 cities across North America to perform 100 shows before ending on Dec. 30. TSO is constantly striving to provide new experiences and audiences can be assured the best is yet to come in 2015. Critically-acclaimed progressive rock band Trans-Siberian Orchestra will release its highly-anticipated new studio album, Letters From The Labyrinth, on Nov. 13 through Lava Records/Republic Records. Known for elaborate production and thematic CDs, with Letters From The Labyrinth, TSO has crafted a bold, conceptually provocative album that pushes the proverbial envelope once again -- this time with what TSO creator, lyricist and composer Paul O'Neill calls TSO's "first hybrid album.” In addition to being available at brick and mortar and online retailers, each 2015 Winter Tour concert ticket sold online will come with a digital copy of Letters From The Labyrinth. 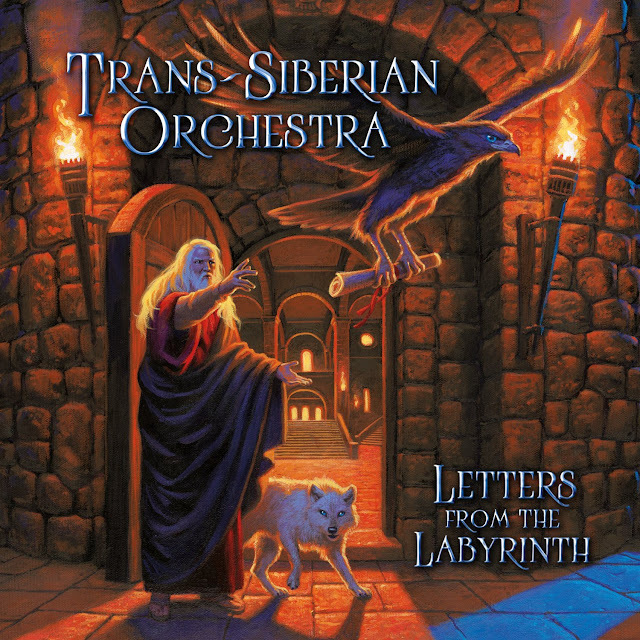 Letters from the Labyrinth, TSO’s first full-length album since 2009’s Night Castle, is a major change for the way Trans-Siberian Orchestra creates new works. It is the first album not built around a completed story. Instead it is a collection of completed songs, which have left the safety of the studio where they were born, and the story will emerge from their combined journeys. The overall concept is based on Night Castle and a dialogue between the wisdom of the past and the hopes for the future, via a correspondence between a child and an old friend of the child's grandfather. FARGO SEASON 3 GETS GREEN LIGHT FROM FX!! NEW ON NETFLIX: MARVEL'S JESSICA JONES !! AMAZON'S INDIE FOR THE HOLIDAYS! NEW GIFT: KIMMER'S AUTOGRAPHED GHOUL POSTER!! GLOBAL SPIN AWARDS RECAP PHOTOS! MY BIG FAT GREEK WEDDING 2 COMING MARCH 2016!! RETRO KIMMER IS 7 YEARS OLD TODAY! !